We are engrossed in the manufacturing, exporting and supplying of Chamber Furnace. We have been catering to the requirements of the customers from all over the world by offering Chamber Furnace fabricated in the well-equipped production unit. 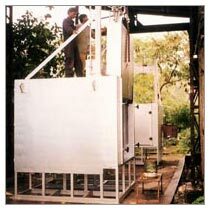 Our industrious engineers make sure that the Chamber Furnace is as per the customers’ requirements. The Chamber Furnace we offer is used for heating purpose and is demanded by the various industrial professionals. Chamber Furnaces are offered for a range of heat treatment applications including stress relieving, normalizing, hardening and tempering. Effective insulation reduces heat loss and aids in faster heat-up. Chamber furnaces utilize electrical heating elements or are gas fired or oil fired. Chamber furnaces are designed to provide consistent results through uniform heating, accurate temperature control and control of furnace atmosphere.